This is pretty much my core collection of cosmetics. I love my Make Up Forever HD foundation with my Beauty Blender sponge and have been using Clinique Dramatically Different Lotion since I was 13. I don't think I'll ever give it up. My blush and bronzer are from Physician's Formula, while my eyeshadow is Wet n Wild. Of course, I can't forget my Maybelline Great Lash either. Some odds and ends include my Philosophy Peppermint Bark lip gloss, Clean and Clear face wash, and my Blistex Medicated Lip Balm, which is the absolute best if you have dry, chapped, or sunburnt lips. Seriously. Mine have been gone in 24 hours with this stuff! Also, my Simple Radiance makeup remover and face wash wipes are the find of the last year, which I discovered after visiting Caravan Stylist Studio prior to New York Comic Con. They take off ALL of my makeup, but don't dry out my skin in the slightest. I couldn't survive without these! Lastly, the ELF Mist and Set Spray totally keeps my makeup fresh and in tact all day long, rain or shine, heat or cold. Can't leave home without it! My five go-to lipsticks: L'Oreal Colour Riche in Zoe's Red (for Zoe Saldana) and Blake's Red (for Blake Lively), MAC Hot Tahiti (my all-time favorite! 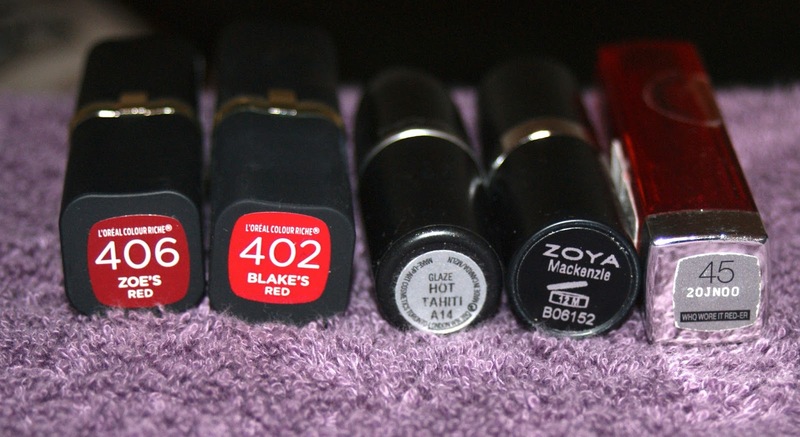 ), Zoya Mackenzie, and Maybelline Whisper Who Wore it Red-er. 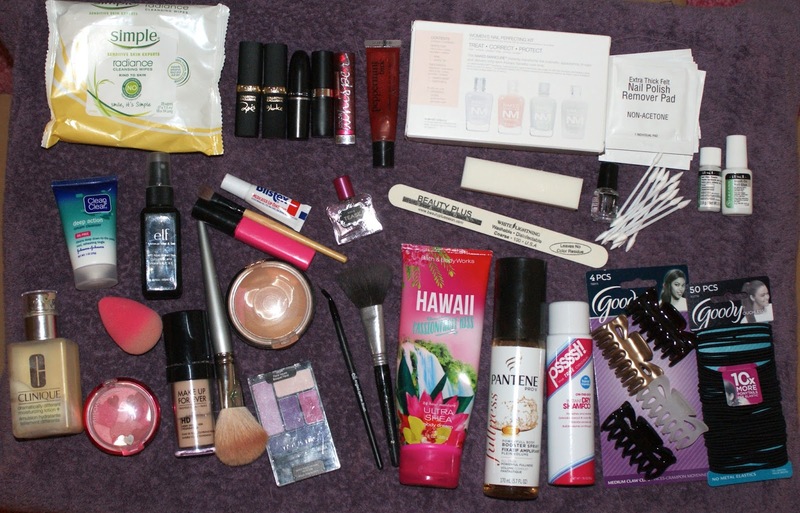 I took some common odds and ends in the form of a nail file, buffer, glue, and powder. Also, the Cutex Remover Pads (made of felt) worked fast and diligently, even on my holographic glitter polish with the Essie Watercolor Silks on top. I also packed the Zoya Naked Manicure System, the special manicure swabs, and a mini bottle of Out the Door Top Coat. It's not my favorite top coat, but it's effective and the only one I could find in a mini size that I approved of. So there you have it! 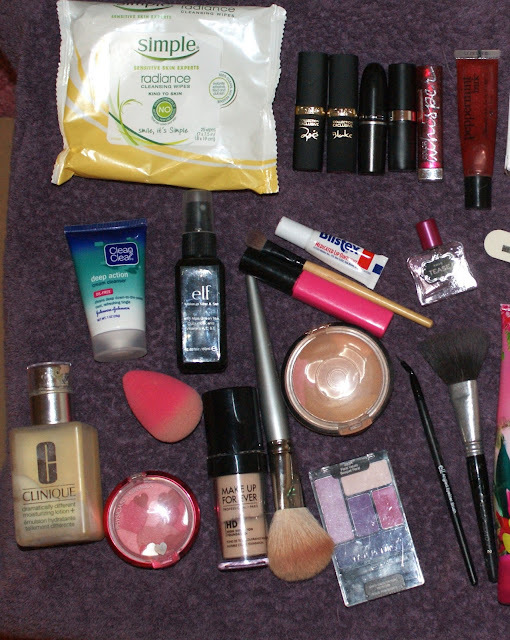 Everything that was in my makeup case on vacation, which is double-sided. Really, it was the best purchase I've made in a long while from the Victoria's Secret Outlet. HIGHLY recommended! Anything you consider to be an essential when you travel? What would YOU take on vacation?